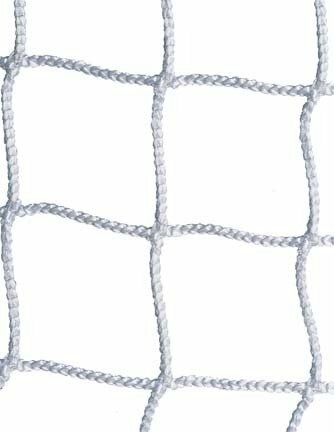 Champion sports nylon mesh lacrosse net is perfect for anyone looking for a regulation size replacement or starter net for organized youth lacrosse or college intramurals. The sturdy 2.5 millimeter thick net features a 1.5 inch square mesh design to effectively stop lacrosse balls in their tracks giving you years of practice, play, and drills. Net easily ties to any standard goal for a safe and secure fit that lasts and lasts. Our high quality mesh nets fit all official regulation size goals and measure 6 foot high x 6 foot wide x 7 foot deep making them ideal replacement or spare nets for schools, park leagues, and lacrosse clubs of all ages and skill levels. Nets are ideal for youth sports leagues, girls and boys lacrosse games and training from the junior level up through high school. The durable construction and universal fit of our nets make them the perfect economical choice for athletic and physical education programs. The heavy duty nylon cord in our lacrosse goal netting is designed to hold up to rain snow and heat ensuring that your net will not tear or fray due to moisture or cold and will last through the seasons giving you year round competition without compromise. Nets are ideal for both indoor and outdoor use. Use for indoor lacrosse at your local gym rec center YMCA and school or use outdoors for play, training, and drills on grass or artificial turf surfaces. PASS 7X4 Ft. 2-in-1 Collapsible Soccer Goal and Rebounder. Portable Practice & Training Aid.